I’ve been a curry lover all my life – something about the way it coats your tongue and makes your throat and ears tingle (because I like it spicy!). Here’s my simple recipe for a Beef and Potato Curry that will have you simmering a pot of it on a weekly basis! Curry lovers rejoice! 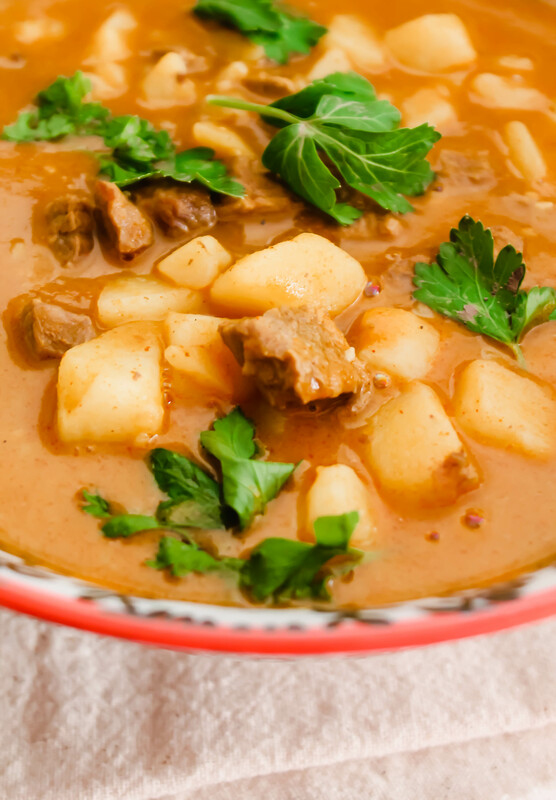 Today I’m sharing this incredibly easy, super simple beef and potato curry. It’s rich, thanks to the full-fat coconut milk. 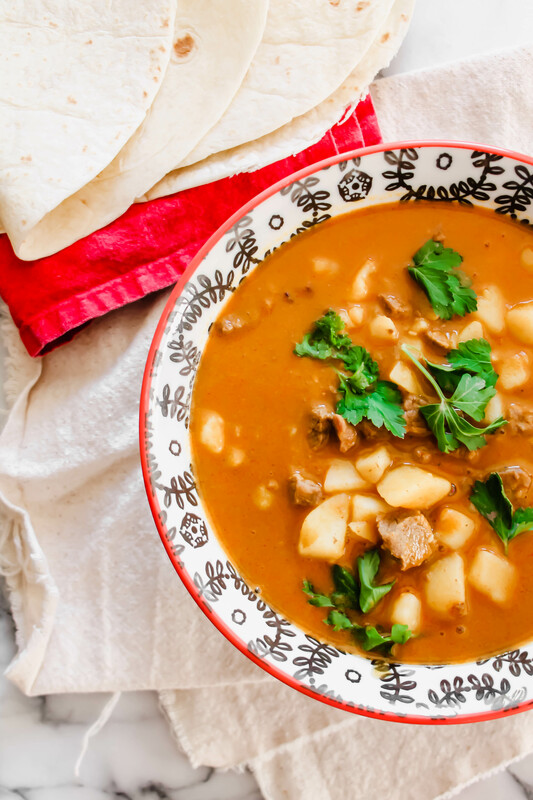 It’s spiced, thanks to the curry paste and cumin, and it’s packed with melt in your mouth potatoes that are simmered in the curry, along with tender beef. It’s one of my favorite meals to make even on weeknights, because it comes together fast enough that I can make it before I jump in the shower after work and let the stove do all the work for me. What makes this easier than it seems is making sure to have a stocked pantry, ready to create delicious meals. For a curry lover like myself, here are some pantry staples that are always in my kitchen (and I’ve linked them to my favorites, not sponsored at all, just the brands I buy at the store or online): red and green curry paste, coconut milk, cashew milk, coconut oil, and ghee. Spices like turmeric, garam masala, and cumin are also essential in my pantry. Top this curry with either fresh cilantro or parsley and you’re ready to enjoy a heart, comforting bowl of curry. 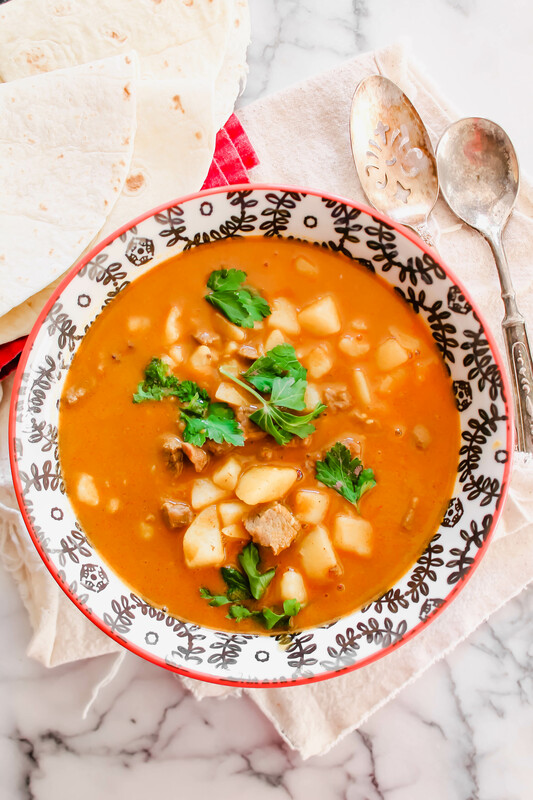 The potatoes in this help thicken it to a rich and delicious stew-like flavor, making it one of my favorite curries to make at home! This quick and easy Indian beef and potato curry can be made in under and hour, and when served over rice, or with a side of naan bread, is a delicious meal! In a heavy bottomed pot, heat the oil and sear the beef pieces. Remove from pot and set aside. Add the onions, garlic, and potatoes. Sauté for about 5 minutes, than add the coconut milk, stock, curry paste, and seasonings. Add the seared beef back in, reduce heat to low and simmer for an hour. Taste to adjust seasonings and serve over rice or with bread. This is basically THE definition of comfort food. It’s hot and humid outside, but super chilly in the office. Can you send this over for lunch please! ?